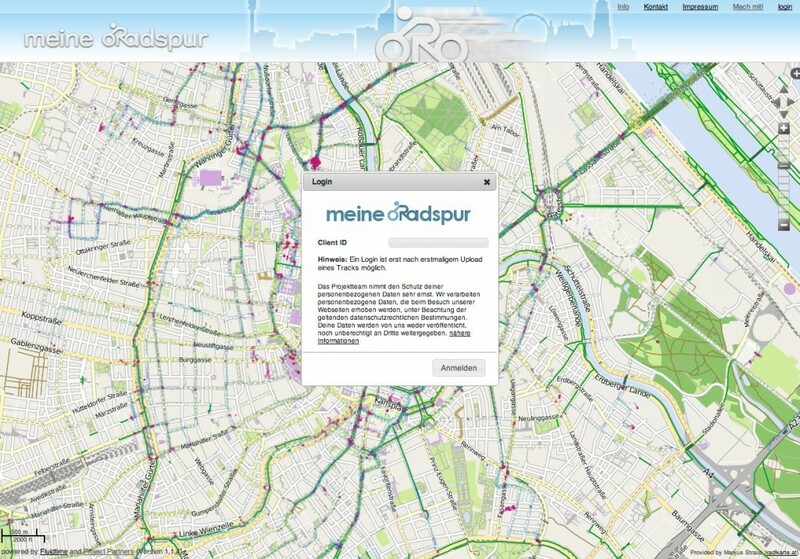 meine-radspur is a GIS app developed in Vienna that tracks the routes used by bicyclists. Riders can indicate hazards and places that need improvements later. I’m organising a roundtable discussion on using social applications (social networks, crowd sourced reporting, online games, wikis, and other tools) for helping improve sustainable transport. We’ll start by identifying existing applications and then brainstorm ideas for Vienna (and beyond). If there’s interest we’ll organise a group to develop a real application or two. If you have questions or good examples to include in the presentation please contact me (andy@andynash.com). 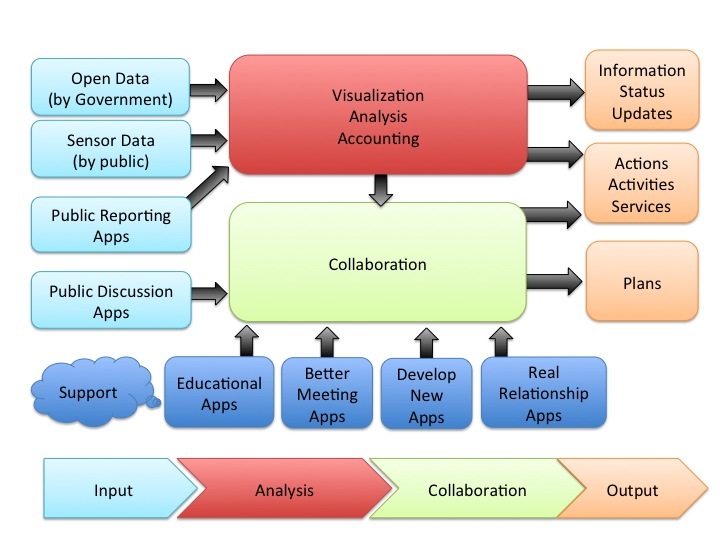 I’ve just finished preparing a paper titled A Proposed Structure for Understanding Interactive City Tools for the upcoming TU Delft conference: Using ICT, Social Media and Mobile Technologies to Foster Self-Organisation in Urban and Neighbourhood Governance. The paper turned out to be much harder than I thought to write because I kept getting different ideas on how to organize the different interactive city tools … by the way, I borrowed the name “Interactive City Tools” from Play the City, an organization doing really great work out of Amsterdam. It refers to a wide set of applications and information technologies that can be used to help the public get involved in improving cities. The paper was useful for me because it gives me a structure for thinking about interactive city technologies. It’s already helped me as I prepared a proposal for developing an application designed to improve the intermodal station planning process. The figure above is from the paper. 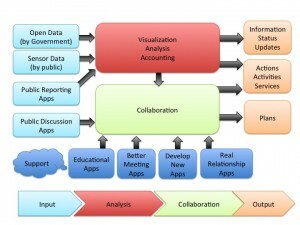 It shows the five main elements of the proposed structure: input, analysis, support, collaboration, and output. Most applications cover several of these elements which is one reason developing the structure was difficult. 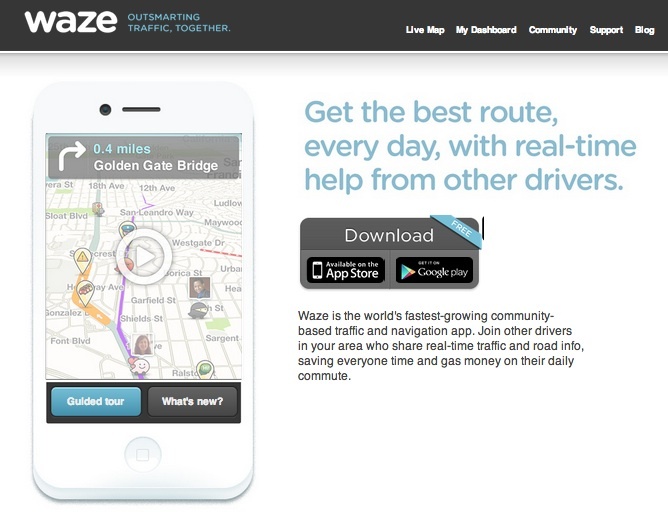 Waze – “Outsmarting Traffic Together” – application homepage. 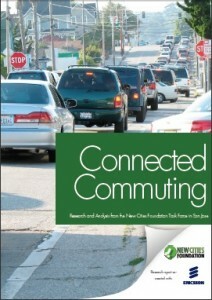 A new report “Connected Commuting” was just released on the use of social networking in transport. The report describes how commuters use two social network apps to share information: Waze (for automobile drivers) and Roadify (for public transport users). The study used two techniques: sentiment analysis of words used in the social network comments and focus group discussions. The primary sentiment analysis method used was a software program that recognizes the emotional connotation behind specific words and phrases. I’d say that these conclusions also apply to transport in general (not just commuting) and the full report is well worth reading. On the other hand, the report seems to go too far with its generalizations about the differences between how auto drivers and public transport passengers use social networking. Clearly these groups use social networking differently, but I think there’s not enough data to support strong conclusions on differences since this field is changing extremely rapidly and the study was based on a limited amount of data. (The Roadify data used in the Sentiment Analysis was for a relatively short amount of time and the focus groups were very small.) This isn’t meant as a criticism of the study, only to say that it’s clearly the beginning of a fascinating field of research. Congratulations to the Task Force for starting the process and developing a structured approach for the analysis. One idea for further research to consider additional social networks and uses of information. Maybe public transport users don’t use social networks as much as drivers because public transport users are well served by existing real time schedule applications. So it would be interesting to consider how social networking apps can be used to achieve other transport goals such as reporting system problems (e.g. seeclickfix) or long range planning input (e.g., GreenCityStreets.com). There were also several fascinating studies on the use of Twitter and Facebook presented at the 2012 Transportation Research Board Annual Meeting (Transit Wire report on Chicago CTA project) and 2011 IIID Transport Conference in Vienna (my summary notes). Read more discussion of the Connected Commuter report at the Transit Wire and Atlantic Cities. The Connected Commuter study was conducted by the “New Cities Foundation Task Force in San Jose” a team consisting of the New Cities Foundation, Ericsson, the City of San Jose’s Department of Transportation, and the University of California’s Mobile Millennium team from the Center for Information Technology Research in the Interest of Society. Yesterday I made my first full presentation in German! After about 10 years in the German speaking world I finally took the leap (of course I’ve made short presentations and informal speeches, but never a full presentation before – perhaps an indication of how well the Swiss, Austrians and Germans speak English). I gave the same presentation on social networking and transport I made at SPUR in San Francisco last week, but this time in German. 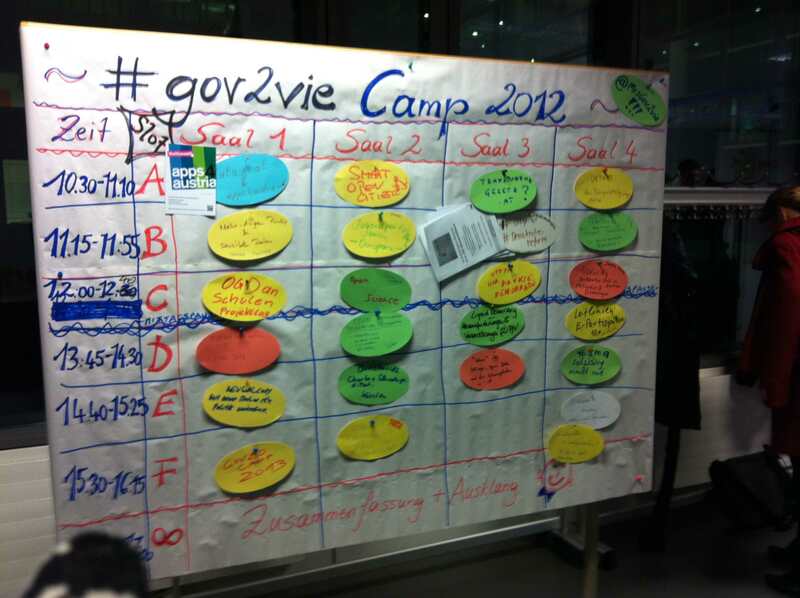 I presented at the Gov 2.0 camp Vienna 2012 a bar camp conference (where the attendees set the agenda at the start of the day and everyone is encouraged to speak/present). The photo above shows the conference schedule. My presentation is in the bottom row, second from the left. It was fun for me to give the presentation and my audience was very understanding, even helping me with the words I was unsure of. Perhaps it helped that the organizers broke out the beer and wine just before the last session to help us all get through. The conference itself was really great, lots of positive energy and good connections. Many attendees were from the city of Vienna administration. They were encouraging and shared lots of good ideas for improving Vienna’s already high quality of life. I’m already looking forward to next year’s conference.